Step 1 Place each chicken breast between two large pieces of plastic wrap. Using the flat side of a meat mallet or heavy skillet, pound each breast until it is uniformly about one-fourth-inch thick. Season each piece with one-fourth teaspoon salt and a pinch of pepper. Place each breast on top of a large piece of plastic wrap or wax paper. Step 2 In a large skillet, heat the butter and 1 tablespoon of the olive oil over medium-high heat until hot. Add the chicken, one piece at a time, and saute until golden-brown, about 2 1/2 minutes on the first side and 30 seconds on the other. Remove the chicken to a plate. Set aside in a warm place. Step 3Drain the excess fat from the pan and add the remaining tablespoon of oil over medium heat. Add the pancetta and saute until browned, about 2 minutes. Add the shallot and saute for 1 minute, until tender, then add the garlic and saute just until aromatic, a few seconds, being careful not to brown. Add the wine, stirring to scrape up the browned bits at the bottom of the pan. Step 4Stir in the chicken broth, the Espelette pepper, thyme and tomatoes. Allow the sauce to come to a 4. Stir in the chicken broth, the Espelette pepper, thyme and tomatoes. Allow the sauce to come to a simmer and cook for 5 minutes so that the flavors develop. Stir in the olives. Step 5Add the chicken back to the pan, spooning the sauce over it. Cook for 1 minute, then remove the chicken to a plate. Spoon the sauce evenly over each piece, and serve immediately. In Recipes-list.com we have selected the most viewed recipes from category - Healthy eating Main courses Quick and easy . Enjoy the best recipes specially selected for you! 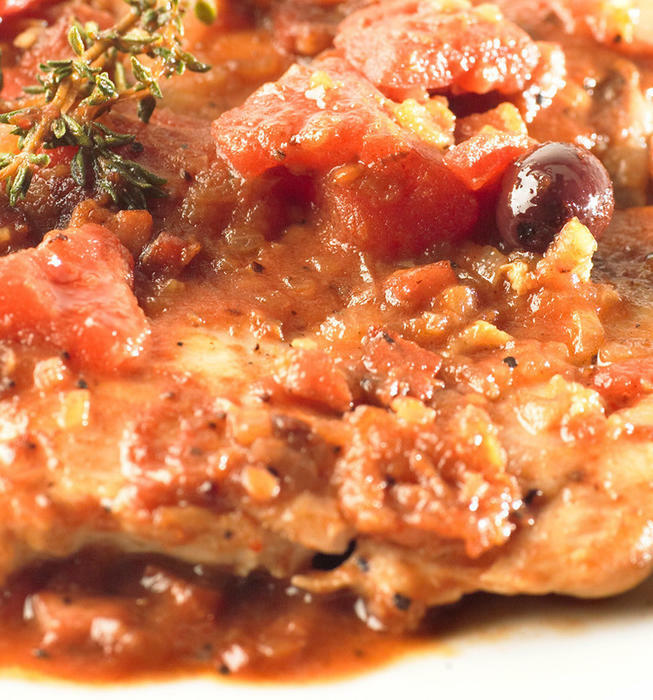 Basque-style chicken is the right choice that will satisfy all your claims.